Animal abusers have struck again. This time they have tried to burn a stray dog alive! This cruel and sad incident happened in Delhi in India where some animal abusers poured petrol on a street dog and set it ablaze. The dog was rescued by some animal care activists and given medical treatment. What is alarming that such incidents have increased over the past four-five years, and are now reported almost every week. 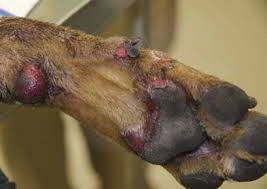 And what is very disturbing is that the dogs are abused in specific parts of their body, such as their genitalia!! The dog which was attacked recently, suffered heavy burns on its belly and testes! This is really sick. After so much of spread of education and activism about animal compassion and animal rights and welfare, instead of being tolerant to animals; people are turning more and more violent towards them! Dogs are deliberately harmed with poison, burning, slashing, acid and beating. These cruel actions clearly show a total lack of value of life and disregard for animals as living beings. As a society, we need to learn to regard animals as living beings like us. We need to respect them as individuals as we respect pther humans. Most importantly, we need to learn that we exist on the planet only because of animals. If they perish, we will perish, too.